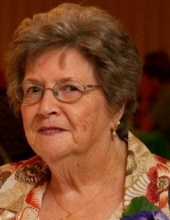 Janice Lee Goldman, age 82, of Birdseye, passed away at 5:16 a.m., Monday, March 25, 2019, at St. Charles Health Campus in Jasper. She was born February 25, 1937, to Herman and Alma (Wright) Andry; and married Victor Goldman in 1953. Janice retired after 30+ years as a school bus driver for the Southeast Dubois County School Corporation. A lifelong member of the Birdseye Christian Church, Janice was also a 50+ year member of the Order of the Eastern Star Birdseye Chapter #590. She was preceded in death by her parents; her husband, Victor Goldman; son, Reiss Goldman; daughter-in-law, Patti Goldman; granddaughter, Brittany Goldman; stepfather, Dale Bailey; and three brothers, Noel Andry, Allen Andry and Kevin Bailey. Janice is survived by six children, Mark Goldman, Kathy (Ray) Stroud, Vikki (Richard) Venekamp, Debbie (Bruce) Lane, Joyce Goldman and Kelly (Steve) Wiseman, all of Birdseye; daughter-in-law, Ruth Goldman; two brothers, Lowell (Linda) Andry and Larry (Sue) Andry; sisters-in-law, Shirley Andry and Marsha Andry; one sister, Lora Gibson; fourteen grandchildren, Becca (Todd) Scott, Zach (Amy) Goldman, Hannah (Jordan) Schultz, Brie (Nick) Decker, Josh (Jennifer) Stroud, Benton (Amber) Stroud, Amanda (Marty) Moore, Matthew (Tiffany) Venekamp, James (Holly) Venekamp, Ryan Lane, Kody (Kristin) Lane, Jesse Goldman, Jonathan Wiseman and Elliot Wiseman; eighteen great-grandchildren; by numerous nieces and nephews. Funeral services for Janice Lee Goldman will be held at 2:00 p.m., E.S.T., Friday, March 29, 2019, at the Nass & Son Funeral Home in Huntingburg with Pastor Ron Hickman officiating and vigil rites conducted by the Order of the Eastern Star at the start of the funeral. Burial will follow at Andry Cemetery in Birdseye. Vigil rites will be conducted by the Order of the Eastern Star Birdseye Chapter #590 at the start of the funeral. Interment will take place at Andry Cemetery in Birdseye. "Email Address" would like to share the life celebration of Janice Lee Goldman. Click on the "link" to go to share a favorite memory or leave a condolence message for the family.